With the exception of a few love-struck years in my teens, I have made it a point in life to never get caught under the mistletoe at my grandma’s house. Every first weekend in December, my grandparents throw what my grandma affectionately calls her Christmas soiree for family, neighbors, friends, the employees of their bakery and their families too. I would say that the invitations are coveted, but my grandma is so generous, that all you have to do to receive an invitation is drop a hint that you want to come. Newcomers to our town are especially encouraged to come and meet everyone. Each year, their grand old house is festively dressed in Christmas finery. Garlands and wreaths and a whole company of tiny twinkling white lights cover the front walk and wrap around porch. Entering in through the great double doors, guests find themselves blasted with the warmth of my grandma’s affectionate greetings and a roaring fire in the great room off the entry. The foyer is two stories high with a palatial, curved staircase rising to the next floor. From the high ornamental ceiling, a sprig of mistletoe dangles on a long cord which rests just over the heads of unsuspecting guests as they first step into the home. As a child, I learned that if I made a giant leap into the room, I could avoid the mistletoe and all the goading and laughter of my cousins and everyone else who kept an eye on the proceedings. The mistletoe is an excellent way for my grandma to exercise her perceived match-making abilities. As soon as we were old enough to figure out what was going on, it’s been good fun to sit with my cousins and sister in the shadowy corners of the great room and try to figure out which two individuals Grandma is going to try and force an intimate introduction on. She typically finds an excuse to keep one unattached victim, or guest rather, busy at the doorway--typically taking others’ coats--and then nabs their intended match as they walk in. The same scenario always follows: a quick introduction between the two, an announcement that they have been caught under the mistletoe, an awkward kiss and cheers and good-natured laughing from the crowd. Then she releases the two with instructions to go get eggnog and better acquainted. I do have to admit that my grandma may have a certain level of finesse with the whole match-making thing. I’ve been going to the soiree for nearly 30 years now and I know of at least three long-time couples (and many more short-term couples) who claim to have been introduced under Grandma’s mistletoe. Grandma says she and the mistletoe know how to work their magic, but I’ve told her that if you have enough people looking for love over the length of time that she’s been holding her soiree, that hormones are all the magic one needs. She just laughs and clucks her tongue at me and tells me I’ll have no power against her magic when she decides to use it on me. And honestly, maybe I could use a bit of magic. Finding that perfect match is exhausting or rather, has been (past tense) exhausting. I decided that while I’m open to a romantic relationship if it happens to mosey along and knock directly on my door, I am done trying to seek one out. Several years of actively seeking a man has gotten me nowhere. The root of my exhaustion can be found in worthless internet dating sites, set-ups from well-meaning but clueless friends, and trying to put on my sparkly best self at get-togethers. Yes, I have met men to date. But, there weren’t too many times that the chemistry seemed right for both of us to put in the effort of more than a few dates together. Of course, there were a few that had longer staying power. I regret all the hours I spent on Alex—hours I will never get back. Hours which, while they taught me an important lesson about trust, in retrospect, would have been better spent vegging in front of the TV, bathing my cat, or having root canals. You get the picture. Everything was going along beautifully, or so I and all my friends and family thought—until I caught Alex stealing money from my parents’ house and I discovered that most of what I thought I knew about him turned out to be a lie. I think our relationship was something akin to the Hindenburg; it looks like it’s going to be a picturesque journey and smooth landing, until everything blows up in an intense fireball. On the other hand, my relationship with Tyler just slowly shriveled like a birthday balloon forgotten and found months after the party, deflated and laddered with puckers. We were never meant to be, but we respected each other too much as friends to admit to ourselves we just weren’t made for each other. Tyler and I spent (I’m ashamed to say) years together. And while I don’t count the time as wasted because we still actually like each other, our relationship, to put it kindly, lacked any kind of oomph. To put it not so kindly, we were pathetic. But, I don’t think of myself as pathetic—just certain aspects of my love life. And so that’s why, as I’m approaching a new year and my 30th birthday, I’ve put seeking out a relationship on the back burner. The reality is I’m really happy with my life. I have family near and far that I actually like to be around. Well, not all of them, but enough of them. And I have friends that I consider family. I travel. I have time for cooking classes, and book club, and tae kwon do. I like my job too. A lot of people would consider teaching high school to be the height of torture. While individual days may be draining, overall I find that interacting with my kids keeps me on my toes and can occasionally be exhilarating. Some days I’m watching the clock just like the kids, but other days fly by and I can’t wait to come back tomorrow and keep the discussion going. Watching kids really wrap their minds around a concept is cool. I love literature and I know I’m not going to help every kid on the spectrum make connections with life and big ideas, but I know that at least some of my kids really get it. And that’s exciting. Right now my life is full. And so a partner in life would be nice, but only if the positives of being with someone outweighed all the stress that relationships can cause. I had just finished outlining my current perspective on dating to my grandma. We descended with the last of the Christmas decorations and deposited them in the foyer along with the mountains of other boxes. My grandparents had devoted most of a third floor bedroom to storing the assorted Christmas paraphernalia. “Your grandpa still insists on getting everything ready for the workers, but he must have missed these last few boxes.” She turned and smiled at my grandpa who was supervising a few young men. Someone in the town had wisely come up with a seasonal business of setting up people’s Christmas lights and other holiday doodads and hit pay dirt when my grandma and grandpa wisely decided that they were no longer up to the task of decorating their huge home. I recognized Troy, one of my former students, and he offered a quick wave and a lopsided grin as he continued to decorate. I’m glad he was able to pick up some part-time work. “Your mom picked up the garlands yesterday. Don’t they smell amazing?” Grandma asked. I watched Troy begin to loop the garlands up the stair railing. Another boy I didn’t recognize began to follow him with a string of lights. My grandparents’ house would be magnificent yet again. “Eliza,” my grandpa called to me. “Help steady that ladder, please.” He motioned with his cane to the ladder that rose to the double high ceiling of the foyer. A worker was busy at the top, but looked pretty solid to me. Thank goodness Grandpa had begrudgingly decided to outsource the actual decorating, even if he still needed to be in charge. “Sure Grandpa,” I responded as I held on to the ladder. Grandma grabbed the other side. We continued to steady the ladder as the worker finished and began to descend. I stepped back as he reached the last few rungs. Harry smiled genially at me. His hand was calloused and I noticed his curly dark hair was dusted with silver glitter. I couldn’t believe I had been snared for the first time in years. It was just barely after Thanksgiving; my defenses weren’t up yet. I could feel my face turning red and my heart thud with embarrassment. Please don’t let him be married or something I thought as I glanced at his left hand. All clear. Harry anxiously stuffed his hands in his pockets, bounced on the balls of his feet and shrugged as I looked at him. Better to take charge and get this over with, I thought. I would concede this victory to Grandma. I stepped forward, stood on tiptoe and gave Harry a quick peck on the lips. My grandpa, Troy and his co-worker broke into applause. “Ms. Turner.” Troy drawled in typical teenage-boy fashion and flashed me a thumb’s up from the stairs. Awesome. All I needed was an audience. Jen, my long-time friend and head of the Social Studies department, hurried with me down the hall. I was recounting the odd encounter at my grandma’s the day before. We scurried to beat the bell before it rang and let in all the students for their first period classes. “Eliza, I hate to break it to you, but your grandma has always been a little loony—in the nicest way possible of course.” Jen gave me a sideways glance as we hurried down the hall. “I believe it may be a family thing,” she deadpanned, jabbing me with her elbow. I rolled my eyes and stopped as we came to my door. I mulled it over. I had been so focused on Grandma that I hadn’t actually given him much thought. Harry seemed easy going and had been pretty funny as the three of us had chatted in the kitchen. He’d been able to turn what I was certain would be a weird and difficult conversation into something actually pleasant. Harry said that he was happy to be in town to spend time with Ralph and his family. The architectural firm he had been designing with had just been sold and he had decided it was a good time for a change of scenery and some down time to focus on some pet projects he hadn’t had time for with his firm’s hectic schedule. Harry could be easy to like. But, I hated when things were forced instead of just happening. I was tired of running after love and wasn’t going to bother unless it came after me. “I don’t think he’s knocking down my door,” I told Jen. “Well, you have to kiss a lot of frogs . . .” Jen began. I gave her a murderous look. The bell rang and students flooded the hallways. “She may have a point,” Jen called over her shoulder as she ran to class. At my lunch break, I scurried down to the teachers’ lounge with a million things on my mind—sustenance being at the top of the list. As I floundered with the heavy door, an armful of papers, and my lunch, I literally ran into Bradley, one of our science teachers and a friend, heading out of the room. Bradley and I had briefly played together on a trivia team that made a circuit of area cafes and pubs. Even if I was a literature expert, it didn’t take me long to learn I was out of my league with the trivia team. But Bradley and I had always had a good time together. “Hey Eliza,” he said, blocking my way. He pointed up to where a ball of mistletoe hung as you walked out of the teachers’ lounge. The music department was selling the mistletoe, wreaths and garlands as part of a fundraiser. Someone must have tacked one up as a joke outside the lounge. I shook my head in disbelief. How could I have been caught by the mistletoe for the second time in as many days? 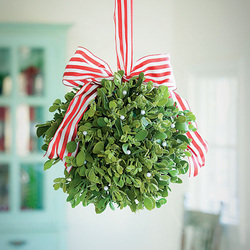 “I can’t believe they’re letting the students sell mistletoe,” Bradley lamented. “I know,” I responded. “It’s dangerous for all these unsuspecting teenagers to accidentally be stuck underneath it,” I said, thinking back to yesterday’s embarrassing drama with Harry at Grandma and Grandpa’s house. Apparently, Bradley knew a lot about mistletoe’s scientific properties, but he was completely ignorant as to its social and cultural legacy, seeing as how he was orating and not osculating. I broke in. “I think we can trust our students not to consume any ornamental plants. I know the cafeteria isn’t going to win any awards, but I think most of them would choose it over munching on mistletoe,” I joked trying to get past him and into the lounge. There weren’t too many ways that my coworkers and I had found to keep Bradley quiet once he got going with a subject he was passionate about. And there were many subjects he was passionate about. With my mind on my waning time, I made a split-second decision. Ignoring about a decade of workplace sexual harassment training, I shifted my armload, quickly grabbed his collar and firmly, but oh so briefly, kissed him square on the lips. “Merry Christmas, Bradley.” I pointed to the ball above our heads in defense. My actions immediately succeeded in shutting Bradley up. “Merry Christmas, Eliza,” he croaked as he wandered dazedly down the hall, leaving me to my lunch break. “So you kissed him right there in the hall?” Jen laughed. Jen’s Accord continued to hum down the highway with her husband Christopher at the wheel. I shared the back seat with their three year old daughter Madelyn. “And so now you think your grandma has given you a voodoo mistletoe curse?” Christopher asked, barely containing his laughter. “We’ll help you watch your back at the arena. Just sit back and relax. We’ll guard against any errant mistletoe attacks,” Christopher offered. Jen and Christopher had offered me a ticket to watch her little brother play in his college basketball game. Since it was at my alma mater and Jen and Christopher were always good company, I had been happy to go along. Plus they were always grateful to have an extra hand with Madelyn at crowded events. We made it to the center with plenty of time to spare. Jen’s brother had gotten us great seats close to the front row and midcourt. Jen pushed me into the row first to make sure I was seated next to the outrageously attractive guy sitting by himself right next to our four seats. Geoff had no trouble starting up a conversation all about himself. I learned he hailed from Boston where his family was well established in the real estate industry. Old family. Old money. He was in grad school on a fellowship—not that he needed a scholarship, but who was he to turn them down when he was the best candidate. His department head thought he was destined for a MacArthur genius grant someday with some of the ideas he was churning out in his chemical engineering program. At one point in his monologue, he even invited me back to his pad to see some of the chemical models he had put together. Quite an offer, seeing as how he hadn’t even determined my name. He briefly mentioned he was here with an old friend who was off buying some snacks. I wondered if only someone as insufferable as Geoff himself could abide being in his company. I also wondered if Geoff always leaned in so closely and flashed his smile so frequently to women he was just getting acquainted with. Not soon enough, Geoff’s friend returned with nachos and drinks, gave me a cold stare, kissed him possessively and draped herself all over him. I was very curious if Geoff’s girlfriend was aware of that Geoff described her as just an old friend to strangers. Grateful that Geoff was now occupied, I focused on the game. As soon as I looked at the jumbotron at half-time, I had a feeling I might be in trouble. The screen had a festive border around it and at the top was a digital image of a sprig of mistletoe. The words “kiss cam” flashed at the bottom as the camera focused on couples in the stands. The camera would randomly settle on a couple in the crowd and the two would generally oblige the crowd with a quick on-screen kiss and a wave. My only saving grace, I thought, was that I was thankfully not part of a couple. My anxiety turned to dread though as the jumbotron suddenly cut to me. I saw my face in half the screen and Geoff’s handsome profile in the other with that digital mistletoe over both our heads. Geoff mugged for the camera and then turned to me with a wolfish grin and one cocked eyebrow. I could not only feel, but, thanks to the jumbotron, see the panic written on my face. I tried to motion the cameraman to swing the camera to the other side so that the kiss cam could capture the actual couple. But Geoff would not be deterred from his moment in the spotlight. He had the gall to wink at the camera as he came toward me, lips leading the way. The kiss promised to be a lingering one, but fortunately, I was able to put my hand up in front of Geoff’s face in the universal ‘stop’ symbol. The camera caught Geoff smooching my palm instead of locking lips with me. The arena descended into laughter which only got louder as the screen captured the girlfriend hitting Geoff over the head with her purse. The girlfriend actually grabbed his ear and pulled him out of his seat. Outside of criminals on TV, I had never seen a grown man frog-marched up the stairs, but that’s exactly what Geoff’s girlfriend did as she grabbed his shoulders and hustled him out of the arena. I fortunately avoided the girlfriend’s wrath and her well-aimed handbag. I was guessing this was not the first time Geoff had played the field. “I wonder if we could get our hands on any footage of that fiasco,” Christopher mused out loud on the way home. “And you promised you would save me from any ambushes!” I scolded him. The next morning, Bradley stuck his head in my classroom door during my free period and when I waved him in, he perched himself on a corner of my desk and awkwardly folded his arms. Happy for a break from grading vocabulary tests, I pushed the pile of papers away from me and rubbed my eyes. “What’s up, Bradley? What can I do for you?” I greeted him. “No worries,” Bradley said as he rapped his knuckles several times on my desk in a happy rhythm and stood up to go. “It’s okay,” he replied, suddenly blushing a startling red. “In fact, I’ve thought maybe I should start carrying some mistletoe in my pocket in case other opportunities don’t present themselves so easily.” He waved his fingers in an odd little too-da-loo gesture and then disappeared. It left me pondering the consequences of impromptu kissing and wondering if I had just made a date for next Tuesday. I wasn’t quite sure how I felt about it. I had hidden out in my classroom all day, hoping to avoid any more strategically placed mistletoe from the fundraiser. Having made it through my workday, I stopped by the gym on the way home. I had skipped several days in a row and with Thanksgiving just past and Christmas and all its festivities fast approaching, I figured my body needed all the maintenance I could provide. My paranoia caused me to zero in on the mistletoe as soon as I pushed open the double doors. A glitzed up sprig was hanging in the hallway that led to the locker rooms so that just about everybody would need to pass underneath it. Mistletoe in a health club? It’s never safe to assume you’re safe. Under the mistletoe was a man that I had noticed the last few months. Even though he was probably in his 30’s, he had joined the group of 40 and 50 year olds that regularly used the open court on Tuesday and Thursday evenings. Previously, I would have made an excuse to meet him well before now. But with my decision to give dating a rest I had only casually watched him from afar. He was tall and a little on the skinny side. Not that I had a lot to go on, as I had only briefly seen him interact with his basketball buddies, but he seemed both nice and a little geeky. In short: my type. His buddies had more or less cornered him under the mistletoe and were good-naturedly explaining to the young ladies that they were hoping for a Christmas kiss for their young friend. I saw three ladies pass by. One ignored the group. Another two passed by, one shrugging her shoulder and mouthing sorry, while her friend pointed to her wedding ring. I had only been here a few seconds, but I was starting to feel sorry for him. If this mistletoe thing is a trend, I thought, I might as well get it over with and take control of the situation instead of stressing out about where the next mistletoe might strike. And the man stuck under the mistletoe wasn’t all that bad looking. Maybe there was something to this tradition. Where else could you simply kiss a stranger with no repercussions? Well, maybe some repercussions. Bradley did come to mind. But this would be quick and helping the poor man out. An act of Christmas charity. Almost. I determined what I was going to do and walked up to the handful of men. “Do we have a taker?” asked the pot-bellied friend with the orange headband and a Pink Floyd t-shirt. “Just trying to help out,” I replied. “I’m Eliza,” I said offering my hand to the entrapped friend. I made good on my promise and the small pack of friends hurrahed. “Take care,” I said over my shoulder as I hurried off to change. When I came out of the locker room a few minutes later, Kyle hopped away from the wall he had been leaning against. Uh, oh, I thought. I’m not sure I wanted this kiss to lead anywhere. I laughed. “Mistletoe seems to be my lot in life this week. Don’t think anything of it,” I said, walking a little faster. What Kyle may have lacked in rhythm he made up for with enthusiasm, which is frankly the way I operated as well, so we spent a good session both working out and laughing at each other too. We stopped by the gym’s juice bar after the Zumba session and spent a little more time getting to know each other. Kyle was easy to talk to. After the last few days, I was starting to reconsider my dating hiatus. Was laughing over smoothies the same as someone knocking on your door? With the exclusion of conceited Geoff, maybe kissing frogs wasn’t as horrible as I thought it was. At my grandma’s request, I stopped by the bakery on my way home from work and picked up several items that hadn’t been quite ready when the bakery had taken a load over in preparation for the next day’s Christmas soiree. I balanced several full boxes emblazoned with the name ‘Turner’s Bakery’ as I tottered up my grandparents’ front steps, across the wrap around porch and knocked at the front door with the toe of my boot. I was surprised to see Troy, my former student, open the door. In the background, his co-worker sat on the floor surrounded by a long string of lights. I nearly stepped into the foyer, but caught myself and looked up. Troy followed my gaze up to the mistletoe and then went bug-eyed with a horrified expression. “On second thought,” I explained hurriedly, retracing my steps, “I think I’ll just take these straight around to the kitchen.” I maneuvered myself and the baked goods back down the steps. High stepping through about a foot of encrusted snow, I trail-blazed a path through the side yard to the back patio and kitchen door. “Goodness, why didn’t you use the front?” Grandma scolded me as she answered my knock. I stomped my boots off on the mat before I delivered the boxes to the kitchen counter. Grandpa beckoned me over from where he sat at the table and I kissed him on the cheek. “Please explain this ‘magic of the mistletoe’ thing to me because I’ve somehow let myself kiss a few frogs this week.” With the exception of jumbotron Geoff, I didn’t realize until just now that I had been the one to initiate the kiss in every situation. Moments after Grandpa and his cane thumped themselves into the hall, Harry entered the kitchen from the dining room. “I think the finishing touches are complete, Mrs. Turner,” Harry announced. “I hope Grandma and Grandpa have left you some time to work for some other families too,” I told Harry. “I’m glad we’ve been able to help out. I’m going to round up the guys and head out if you don’t need anything else. It’s been a real pleasure to meet your family.” He smiled and nodded his head in a miniature bow as he backed up. I started to feel disappointed that I’d shown up just as Harry was headed off. He had been awfully nice after Grandma had ensnared both of us a few days ago. “We’ll see you tomorrow,” Grandma said to Harry in farewell. There was a little prickle of joy in my chest. The soiree was always fun, but having Harry here may be an extra bonus for this year’s event. Harry waved a quick goodbye to the two of us and headed back through the dining room. Why was Grandma asking Harry to help out? I was perfectly capable of carrying a couple of snow shovels by myself. Grandma gave me no hint as she hummed to herself and tracked down a flashlight for me. I waited while Harry got his coat and then we headed out to the back shed. The driveway and walks had been cleared of snow and salted in anticipation of the guests tomorrow, but Harry and I had to forge our own path through the snow as we trekked to the shed in a deep corner of the property. “I think the shed was originally a smokehouse,” I explained to Harry as we walked in the crisp air. I lost my balance for a moment in the snow and Harry grabbed my elbow to steady me, making sure I was okay before we continued on. The mention of the passageway reminded me of a slightly embarrassing story from my tween years that involved me, my sister Charlotte, and a multitude of cousins. I decided to share it. When we arrived at the shed we were both laughing. I removed the pin holding the door and swung it open. The shed was practically empty; only a few wooden crates were scattered in the corners. “Harry pointed up to where several old hardwood trees wove their branches together over the roof of the shed. Several large bunches of mistletoe had rooted themselves to the bare branches of a red maple. One particularly large mass of the evergreen plant hung directly above our heads. A tingle—the nice kind—started at the base of my spine and made its way up my back. “You don’t need to apologize, Eliza,” Harry said softly, taking my hand. He bent at the waist and lifted my hand, gently brushing it with his lips. He didn’t let go as we turned to retrace our steps. “Let’s head back. I have a feeling Grandma might suddenly remember where the shovels really are. Grandma opened the door wide and even though the party was in its early stages, the happy cacophony of the soiree spilled out into the chilly air. I led Kyle near the fireplace and we plopped down on one of Grandma’s comfy couches in the corner with a view of the front door. I introduced Kyle to a few of the other family members and friends who lounged there too. It was fun to chat up some of the friends I didn’t get to see as often. One of my cousins settled down near me on the sofa and told me that she had just seen my boyfriend come into the house a few minutes ago. I sat up straighter and a smiled. I didn’t know he would be here so early—funny I hadn’t seen him come in. He had a meeting in the city and we didn’t think he would be back until later on when the party was in full swing. We had decided that I would bring Kyle so I could introduce him to Lauren and that he would come straight to the party when his meeting was done. I whispered to Kyle that I would be right back and went to look for him. As soon as I turned around, I ran straight into Bradley. “Looking lovely as usual, Eliza,” Bradley said, squeezing my shoulder familiarly and giving me a quick peck on the cheek. “Have you tried this eggnog?” he asked handing me one of the two glasses he carried. The woman I had replaced temporarily on Bradley’s trivia team decided to move permanently and so at Bradley’s urging, I sweated my way through several weeks of matches. I finally convinced my sister Charlotte to come check out the trivia circuit. Her encyclopedic knowledge of all things arcane, weird and wonderful immediately earned her the respect of the team and I was only too glad to bequeath my spot to Charlotte when they recruited her. Bradley soon found that he was as passionate about Charlotte as any scientific principle he had ever studied. They were a perfect match. After a quick engagement, they got married shortly after school let out for the summer. Bradley was all that I could ask for in a brother-in-law. He was smart and fun and I only got him in small doses at family dinners and staff meetings. I waved my hand in acknowledgement and went to discover where my early arriving boyfriend was. Kyle and Harry had hit it off from the first day I introduced them. It didn’t hurt that their jobs complemented each other so well. Urban sprawl was creeping closer and closer to our little town. What had once been a sleepy community was now being considered a prime location for those who wanted some space and were willing to commute into the city. Younger couples were snatching up many of the older homes. Kyle was a real estate agent and he was happy to introduce his clients to Harry who was brought in to convince the family the home could be transformed to their taste. Harry was doing a brisk business with his designs to modernize and update the tiny kitchen and bathrooms while maintaining all the original craftsmanship and charm. The business was young, but word of mouth kept Harry busy. “Trying to avoid the foyer and mistletoe?” I laughed, squeezing his hand. “Hold that thought and follow me.” Harry escorted me from the dining room into the foyer. He led me until we stood underneath the mistletoe where we had first met. My heart thumped wildly and a grin so big it nearly hurt spread across on my face. I pulled Harry to his feet. The resulting kiss more than made up for last year and left no doubt in anyone’s mind—especially Harry’s—as to my answer. “I’m glad you said yes,” Harry murmured. I knew Harry wasn’t perfect and I certainly wasn’t either. But, we might just be perfect for each other. We were willing to accept each other—warts and all. Harry had definitely turned out to be one frog worth risking a kiss on. “I’m glad you’re a man worth saying yes to.” I kissed him again. No mistletoe needed.